The Bermuda Triangle is infamous for making sea vessels mysteriously disappear, but it’s not the only body of water with dark secrets and seemingly paranormal activity. There are a few other nautical locations where vessels and crews have been known to inexplicably vanish without a trace. The Bermuda Triangle, a region of the western part of the North Atlantic Ocean defined by points in Bermuda, Florida and Puerto Rico and has a long-standing reputation for mysteriously swallowing boats, ships and even airplanes. Some people even claim that it contains a wormhole into another dimension, while others believe that the area is a UFO hotspot and that aliens are abducting the lost sea vessels. The 14 men in the planes were never heard from again. Even spookier, a search-and-rescue aircraft with 13 men onboard was dispatched to locate the missing planes, but that aircraft and its passengers also inexplicably disappeared. Ever since, the disappearances of vessels in the area, including the SS Marine Sulphur Queen, a tanker carrying a crew of 39 in 1963, and the collier USS Cyclops with 309 crewmen in 1918, have been blamed on the Bermuda Triangle. The term was never used before until 1945 when the flight of the five Navy training planes (the infamous “Flight 19“) ran out of fuel and ditched, and were unfortunately never recovered. 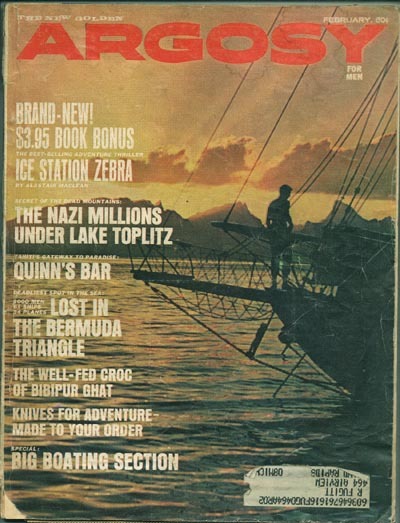 An author, Vincent Gaddis, dramatized this in the fiction magazine Argosy in 1964 with a story titled “The Deadly Bermuda Triangle”, the first time the name is known to have been used. There are also legitimate explanations behind the disappearances and accidents surrounding the Bermuda Triangle. The most famous incident occurred in 1945, when the squadron of American bombers mysteriously disappeared over the Bermuda Triangle on a routine training mission. While believers of the Bermuda Triangle point to this famous incident, they do not point to several known facts. On the day of the disappearance, bad weather was reported in the area. The leader of the squadron, Lt. Charles Taylor, was the only member of the squadron who was an experienced aviator. Unfortunately for the other pilots in the squadron, Lt. Charles Taylor was also prone to getting lost. He became lost three times throughout World War II, and twice he had to ditch his plane. This is a fact which hardly gets mentioned when talking about the “mysterious disappearance of Flight 19“. The area known as the Bermuda Triangle contains some of the most traveled shipping routes in the world. The area is also in a geographical region where hurricanes and tropical storms are common occurrences. When we stop to consider these factors, it will only be logical that this particular area is prone to higher-than-average accident rates. The Bermuda Triangle remained a relatively unknown footnote until 1974, when paranormal author Charles Berlitz published his mass market paperback The Bermuda Triangle. It was the perfect book for the New Age movement of the 1970s, and quite suddenly the Triangle became a giant fixture in urban legendry. The Devil’s Sea, also known as the Pacific Bermuda Triangle, is a region of the Pacific around Miyake Island, about 60 miles south of Tokyo. The area is also known as the Dragon’s Triangle because of ancient legends about dragons that lived off the coast of Japan. During the late 1980s, author Charles Berlitz wrote the book “The Dragon’s Triangle” about paranormal phenomena that he believed occurred in the Devil’s Sea. He wrote that after Japan lost five military vessels with carrying a total of more than 700 sailors during the peacetime years between 1952 and ’54, the area was officially declared a danger zone. Investigations into Berlitz’s claims later found that the military vessels were actually fishing vessels, some of which had vanished outside of the Devil’s Sea. Additionally, investigators pointed out that during the time period that the ships went missing, hundreds of fishing boats were lost around Japan every year due to weather conditions and piracy not because of supernatural activity or mythical sea dragons. But the Devil’s Sea’s reputation as a dangerous and eerie area lives on. The only “sea” without shores, the Sargasso Sea is a region in the middle of the North Atlantic Ocean that is surrounded by ocean currents. These currents deposit marine plants and garbage into the Sargasso Sea, causing it to be full of Sargassum, a genus of dense, brown, invasive seaweed. Because of the seaweed buildup and the isolation created by the currents, the sea remains eerily warm and calm, despite being surrounded by the freezing and choppy waters of the Atlantic Ocean. This eerie calmness contributes to the area’s mystery, as several ships have been found drifting crewless through its peaceful waters. In 1840, the French merchant ship Rosalie sailed through the Sargasso Sea and was later discovered with its sails set but without any crew members on board. In an effort to explain the mysterious disappearances, nineteenth-century lore told of the Sargasso Sea’s carnivorous seaweed, which was believed to devour sailors whole, leaving only the ship. The Michigan Triangle is found in Lake Michigan, whose shoreline spans the states of Illinois, Michigan, Indiana and Wisconsin. Located over central Lake Michigan, the area has been blamed for the mysterious disappearances of ships’ crew members and entire airplanes. Some have reported that while sailing over the Michigan Triangle, time seemed to stand still, slow to a crawl, or speed up. According to author Linda S. Godfrey in her book Weird Michigan: Your Travel Guide to Michigan’s Local Legends and Best Kept Secrets the Michigan Triangle starts from the town of Ludington to Benton Harbor in Michigan; another links from Benton Harbor to Manitowoc, Wisconsin; the final side connects Manitowoc back to Ludington. Bill Wangemann is a historian from Sheboygan, Wisconsin. He’s spent a lifetime gathering tales about the Lake Michigan triangle. The legend doesn’t end with sunken ships; nearly 40 planes have disappeared over Lake Michigan too. Probably the most famous is northwest airlines flight 2501 that took off from New York City headed for Minneapolis in June of 1950 and plunged into Lake Michigan just off Benton Harbor. No one survived. Then, there are the sightings of UFO’s and other strange anomalies in the sky. In fact there have been so many sightings of strange objects and phantom planes that the Federal Aviation Administration (FAA) created a special lake reporting service (LRS) to catalog the reported sightings. And yet still, thousands make the journey through the Triangle every season. “There’s dozen’s of these stories about different things that have occurred out there and people that have been lost and sailors that have disappeared off of ships and some people claim that there is something supernatural going on out on the lake,” says Wangemann. The wreck of the schooner Rosa Belle and the loss of 11 crew members and passengers, all members of the Benton Harbor cult House of David, shocked the nation in the fall of 1921. The wreck was discovered on Oct. 30, floating upside down by the Grand Trunk car ferry Ann Arbor No. 4. The captain of the ferry said it appeared as if the schooner had been in a collision with another vessel. But no other ship was found to have been in a collision that week. The aft section was smashed, the cabin was wrenched away from the deck and the ship’s rigging was floating loosely about the hull. The mystery of what happened to the Rosa Belle was never solved. Strange too was the fact that it was the second almost identical wreck for the Rosa Belle. The vessel capsized in the same area and drifted ashore near Grand Haven, Michigan, in August, 1875. Ten crew members were lost. The wreck was recovered at that time and rebuilt. Among the strangest of the mysteries was the disappearance of the schooner Thomas Hume, which disappeared without a trace in a Lake Michigan gale on May 21, 1891, while sailing empty from Chicago to Muskegon, Michigan to pick up a load of lumber. Seven sailors, including Captain George C. Albrecht, were lost with the ship. Even though the lake was searched thoroughly, not a stick of lumber or piece of flotsam from a wreck was ever found. Old sailors speculated that the Hume, a wooden vessel, could not have sunk without some wreckage floating away. To this day, the Hume’s disappearance remains unsolved. In 1937, the disappearance of Captain George Donner from his boat cemented the Michigan Triangle’s status as a strange place. During a routine coal delivery, Donner gave his crew orders to wake him when the ship drew into port. When they came to his freighter cabin three hours later, Donner had vanished despite the fact that his cabin door was locked from the inside. In 1950, the Northwest Airlines Flight 2501 disappeared as it flew over the Michigan Triangle on its way from Seattle to New York City. With 58 people on board, the plane seemed to vanish into thin air, and neither the plane nor any passengers were ever found, despite a thorough search by the Michigan Shipwreck Research Associates. Vile Vortices is a term referring to twelve geographic areas that are alleged by Ivan Sanderson to have been the sites of mysterious disappearances. He identified them in a 1972 article “The Twelve Devil’s Graveyards Around the World”, published in Saga magazine. The best known of the so-called “vortices” is the Bermuda Triangle. Others include Algerian Megaliths to the south of Timbuktu, the Indus Valley in Pakistan, especially the city of Mohenjo Daro, Hamakulia Volcano in Hawaii, the “Devil’s Sea” near Japan and the South Atlantic Anomaly. Five of the vortices are on the same latitude to the south of the equator; five are on the same latitude to the north. The other two are the north and south poles. Why are ancient Megaliths placed at specific equidistant points, such as Mohenjo-Daro,Cairo, Peru, Easter Island, Zimbabwe, and Borneo, to name a few. Why are Positive Energy Vortices, such as in the Himalayas, Sedona (AZ), & the Incan culture situated where they are? – Hamakulia,S.E. Hawaii(heaviest volcanic activity) – actually, the focal point is in the ocean, more to the SE of Hawaii. It is in the Ocean, where some ships and planes have disappeared in the past. – Between Sedona,AZ & Sonora, Mexico (31.7N 112.8W) – Hopi & Yaqui Indian, Hohokom waterworks, Sedona Healing Vortex, – (& magnetic anomalies at Torreon, Mexico?). The calculated Vortex Focus is near the Papago Indian Reservation, W of Tucson, AZ, S of Pisinimo/W. of Cowlic/Vamori/Little Tucson. According to Ken Eagle Feather, in “A Toltec Path” p.11, Castenada’s Books on Don Juan (Matus) were centered here. – Gabon (WestAfrica) [alleged natural Atomic Reactor 1.7million yrs ago??]) / Zimbabwe Megaliths.